VANCOUVER, BC April 21, 2015 – World Oceans Day has taken on new meaning to the production team at Parallax Film Productions. After spending months filming their latest project called Bahama Blue, a bunker oil spill occurred in their hometown Vancouver, just as they were delivering the final episodes. Parallax started by focusing on the classic A-List Species: sharks, dolphins and whales, but quickly learned that just like there are no small roles, only small actors, the Bahamas were filled with countless extraordinary creatures: rare species of iguana found nowhere else on earth, tiny tree crabs who need to stay wet to breath and a type of comb jelly that predates the dinosaurs. The series blends rich 4k cinematography and macro photography, that allowed the team to film creatures ranging from tiny thimble jellyfish to giant sperm whales. Its signature ‘tide lapses’ and intimate aerials set the creatures in their environment: a view of the Bahamas beyond the beaches. 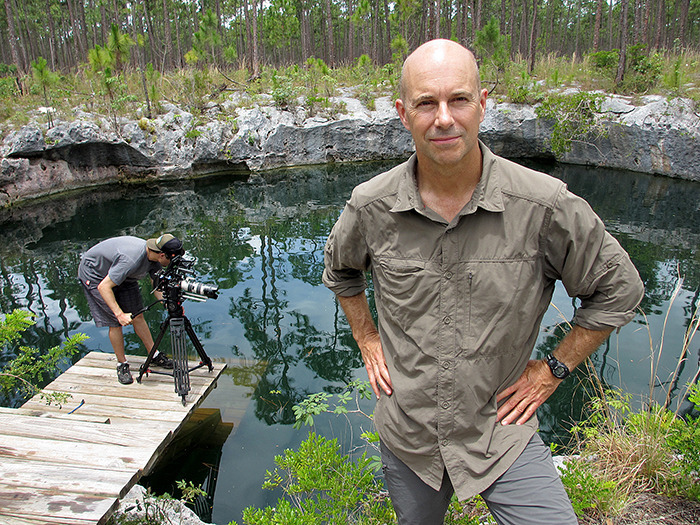 World Oceans Day is June 8, just before the sixth and final episode of Bahama Blue. Parallax intends to support the worldwide event by sponsoring a Twitter chat with one of Bahama Blue’s underwater cameramen, Andy Brandy Casagrande, to discuss his role creating images that inspire ocean conservation. Bahama Blue will broadcast in French Canada in the winter of 2016. May 24 in Italy on Focus TV. Other international broadcast dates are forthcoming. Parallax Film Productions, founded in 1996 by Ian Herring, has delivered more than forty-five hours of blue chip factual programs to broadcasters all over the world. The team uses the latest in film technology to provide powerful storytelling with unprecedented visuals in HD, 3D and 4k for multiple media platforms. Parallax’s recent series Battle Castle, a television and convergent media project, received a nomination for Best Historical or Biographical Series in the 2013 Canadian Screen Awards and seven Leo Award nominations of which they won four, including Best Documentary Series. Their international broadcasters and partners to-date are Discovery Channels (US, Canada and International), National Geographic Channels (US, Canada and International), Love Nature (Canada) History Channel (US), Channel 4 (UK), FIVE (UK), DMAX (Germany), RAI (Italy), TV Asahi (Japan), PBS NOVA and Nature, History Television (Canada), BBC Worldwide and Parthenon Entertainment.